Did you know that there are over 400 parks in Montgomery County, Maryland? They make up 10% of the county’s land (34,000 acres!) and anyone in Montgomery County is within 2 miles of a park at all times. Montgomery County, MD has plenty of parks for everyone, but there are so many that it can be overwhelming. Don’t worry, we’ve dug through the records and have found the very best parks that Montgomery County has to offer. Scroll down and you’ll also find a list of dog parks in Montgomery County. The only question is, which one will you visit next? Black Hill Regional Park is located in Boyds and offers many amenities including 20 miles of paved and unpaved trails appropriate for biking, hiking, and horseback riding. If you’re unable to transport your bike from home, the park has a Zagster bike share where you can easily rent a bike for the day. There is plenty of space for fishing on Seneca Lake – there are even boats for rent. The park is 2,000 acres, ADA-accessible in many parts, and has nice playgrounds for kids. Come enjoy a day in nature at Black Hill Regional Park. Brookside Gardens is a 50-acre garden within Wheaton Regional Park, but is large and beautiful enough to spend a full day there. Admission to the garden is free and within you’ll find many distinct areas with different styles. Some include the Butterfly Garden, the Rose Garden, a Japanese Garden, a Rain Garden, and a Maple Terrace. No pets are allowed inside the Gardens. Looking for a place to ride? Woodstock Equestrian Park sits on 872 acres of farmland and forest and is open to the public each day from dawn until dusk. At the park, there are 16 miles of trails that include 3 horse-friendly bridges. Additionally, there is an outdoor riding ring and a cross-country course with bank and water jumps. The park can be rented out, so consider calling ahead to make sure the park is open. Want to go camping with the kids? You don’t have to drive far. Little Bennet Regional Park in Clarksburg has 3,700 acres of forests and meadows with 91 wooded campsites. While you’re camping, enjoy the 25 miles of natural surface trails by foot, bike, or horseback. For some educational history, visit Hyattstown Mill, the Zeigler Log House, and the Montgomery Chapel Cemetery. And of course, kids will love the playground. If you’d like to learn more about agricultural history, the Agricultural History Farm Park is the perfect destination. The park features 455 acres of open hills, an apple orchard, old farming structures, and plenty of farm animals. The park also has 4 miles for natural surface trails that are appropriate for horseback riding or hiking. Learn about African American history while visiting a historical park in Montgomery County. A community of African Americans lived at this site from emancipation until the mid-20th century. At the center of the park is Oakley Cabin, a one and a half story cabin dating back to the 1800’s. Blockhouse Point Conservation Park is a 630-acre park with 7 miles of natural and hard surface trails open for hiking and horseback riding. The Blockhouse Point is a natural conservation area, making it a perfect destination to get out of the city and enjoy the fresh air. Montgomery County has a lot of great urban parks, but Woodside Park is special because it includes a 3,500 square foot skate park. In addition, there is a playground, handball courts, and tennis courts. One beautiful park in Montgomery County also serves as the Montgomery Parks offices within a home built originally in the 1790’s. This 3.9-acre park has unique historic structures, well-maintained grounds, and serves as the headquarters of a non-profit focused on heritage tourism and historic preservation. The Capital Crescent Trail is an 11-mile paved route for cyclists, joggers, and rollerbladers. It follows an old railroad right of way and extends from Silver Spring to Georgetown in Washington DC. The trail will continue to Bethesda in 2022, after the completion of the Purple Line rail line. To decide where to enter the trail, check the website for the most convenient entrance. Lake Needwood is a 75-acre lake located in Rockville. Don’t own a boat? 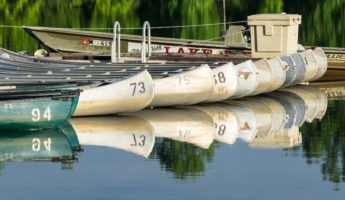 That’s fine – Lake Needwood rents kayaks, canoes, rowboats, and pedal boats. There is also a Pontoon Tour available during the summer aboard the Needwood Queen. Fishing on the lake is allowed and dogs are allowed on the rented boats too! 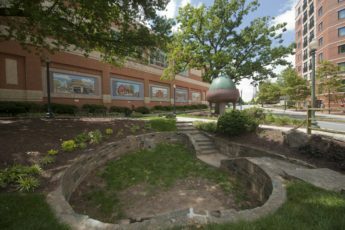 There are several parks that offer community garden space in Montgomery County, but the Parklawn Community Garden space stands out. It has 45 plots of 400 square feet each. The site offers water, fencing, and shelter. But, unlike other community garden space, your kids will want to come along. Why? Because Parklawn also has a playground! This cute urban park is nestled in between buildings in Silver Spring. What makes it stand out is the tiny acorn gazebo in the center. The pavilion was built as a gift from a husband to his wife in the 1800’s and was moved to its present spot in 1955. Read more about the sweet love story that inspired this gazebo and then visit it in-person yourself. 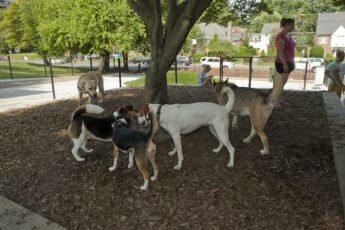 While dogs can visit most Montgomery County parks on leashes, there are six county-owned parks where Fido can play off-leash. Read up on the rules that govern the use of Montgomery County dog parks before you go. This park has two separate areas divided by dog size – dogs under 20 pounds have a 2,800 square foot space and dogs over 20 pounds have a 17,000 square foot space. Each space has water, a play mound, shade, and trash receptacles. Wheaton Regional Park has a fenced in dog park as part of its overall amenities. Ridge Road Recreational Park has a half-acre fenced-in dog park. Olney Manor has a 1-acre fenced-in dog park for large and small dogs. Black Hill Regional Park has a half-acre fenced-in dog park. Cabin John Regional Park offers a shaded dog park for small and large dogs.